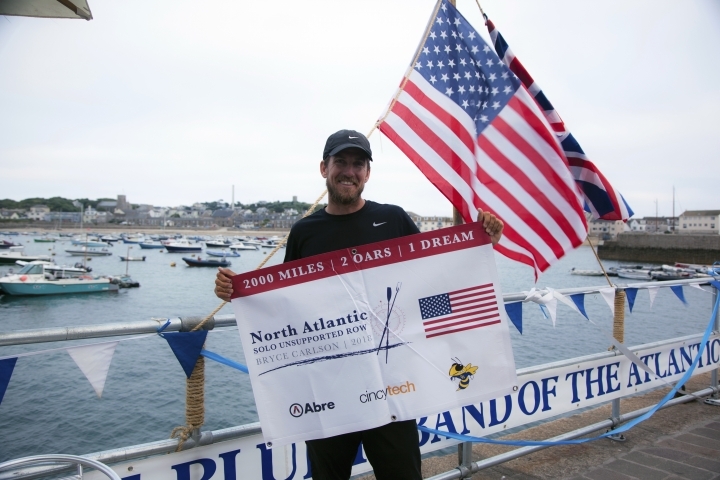 LONDON — A high school science teacher from Cincinnati, Ohio, has rowed solo across the Atlantic Ocean, setting a record for a west-to-east crossing. Bryce Carlson arrived at St. Mary's in the Isles of Scilly, off England's southwestern tip, late Saturday — 38 days, six hours and 49 minutes after setting out from St. John's, Newfoundland. The 37-year-old athlete was applauded by relatives and well-wishers as he stepped onto the quay at St. Mary's Harbour after rowing more than 2,000 miles (3,200 kilometers) in his 20-foot (6-meter) boat, Lucille. Carlson capsized several times and endured high waves and the remnants of a hurricane during his journey. "I feel like I had a lot of luck along the way, and a lot of help," Carlson said. "Help from my friends, my family, the community — from some higher power, I don't know." The Ocean Rowing Society listed Carlson's time on its website Sunday as the fastest for a west-to-east unsupported solo row. The previous record was 53 days, eight hours and 26 minutes. Carlson also is the first American to complete the feat, according to the society.